We welcome Apple (or anybody else!) using our map data and we’d like to see them use it more. If you are having problems with the maps on your phone, have a look at an app that only uses current OpenStreetMap data. That way, you’ll know the source. And if you find that the data in your area can be improved or updated, you can improve it! We hope you’ll join us and help make a free and open map of the world. There are so many OpenStreetMap powered apps (click here for a list). If you already have a favourite, please add a comment below to tell us which one it is, and why. If you’re an iOS developer you can use an OpenStreetMap map within your app. You have a choice of several different libraries to do this: The open source route-me, or offerings from MapQuest or from CloudMade. If you’re not an iphone user maybe you’re bored of all this apple talk. We do have apps for android and also windows mobile, blackberry, symbian and much more besides. Developers have brought our free and open data to many different mobile device platforms and navigation devices. 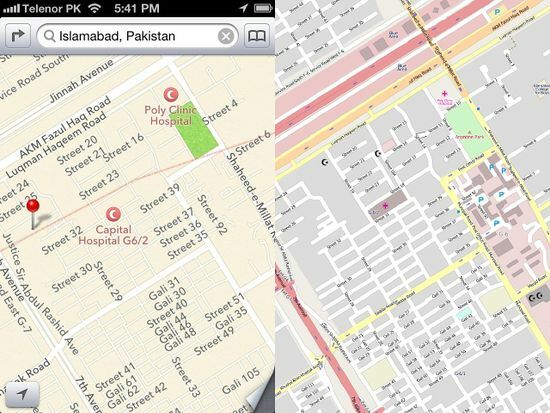 Whichever technologies you’re using to view maps, we hope you’ll choose free and open map data from the not-for-profit OpenStreetMap project. This entry was posted in Uncategorized on October 2, 2012 by HarryWood. BTW knows anybody how they deal with our copyleft license (guess it’s old so CC BY SA) there? Usually companies don’t mix stuff, but Apple seems to mix different licensed sources and at least for endusers it’s not clear, where they are free to reuse the data/maps. Surely if it is using open street map data it would have to release all the data as open data, which it clearly hasnt done. If Apple has used data from OSM it is clearly pre-licence change. CC by-SA doesn’t require release of the subject mater in any specific form, it just requires you to allow further distribution of what you have published (assuming that CC by-SA would actually be considered relevant to OSM data). There are some very sane reasons that we spent the last years working on the licence change. Thanks for your answer Simon. But how can the community and the OSMF deal with this case? Should we request a more specific attribution, or just ignore Apple’s us of our data? I believe we should ask Apple to fine tune the attribution string. I agree with you Simon. They should put a © mark in front of OSM contributors, and should tell what is the license of the OSM data they are using. IMHO they should also specify or somehow mark, which part of their product contains OSM data so people could reuse these parts under share-alike conditions. Anyone who wants to see iOS app with *only* OSM data should take a look at UK TravelOptions, which has OSM maps and POIs along with live and timetabled travel information for the UK. You can get it on the App Store (http://itunes.apple.com/gb/app/uk-traveloptions-pro/id541885004?mt=8) or via http://uktraveloptions.com/. There are also iOS apps called Nearby USA and Nearby Norway using the same mapping engine from FasterImaging and OSM data.